Terminal Block Headers have 2-row, space-saving design. 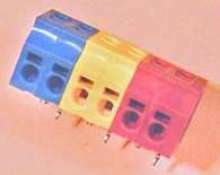 Series 622/645/675 terminal blocks provide flexibility to match wire color to terminal block color. Series 622 features dual-wire entry, Series 645 offers angled wire entry, and Series 675 provides for front wire entry. All products are screw-less style terminal blocks that lock wire in place. Pin configuration is for PCB mounting. 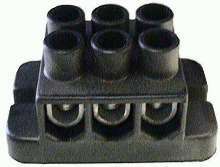 Push-In Connectors have current rating of 24 A.
Terminal Blocks have current ratings up to 85 A.
Terminal Blocks ensure mating in high vibration applications. CIF and CIM locking screw flange, female and male pluggable terminal block connectors provide safe and solid connection. Units are offered in 2-25 pole configurations in 5.00 mm or 5.08 mm pitch. 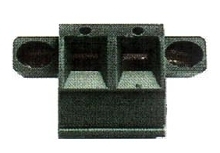 Terminal block header is PCB mounted and available in vertical or right angle styles. Standard colors are green and black with other colors optional.